Hi everyone, yes I’m back. I’m sorry for not posting anything in a long time, I have a good reason for it. On February 24th I moved out of my parents home and into a new little basement suite with my boyfriend. It is our first place together and our first time living together, but so far I find things are going nicely. Even though I was told by many co-workers that moving in together would destroy our relationship and we would end up breaking up. So far we are still together and just making our new place look like a home for the two of us. So besides just the moving in and unpacking everything, which sadly to say there is still boxes I haven’t unpacked, mainly because I really don’t know where to put it yet. I have been of course busy with that and there was about a week in the beginning where we didn’t have any internet and I personally don’t like typing blog posts on my phone. 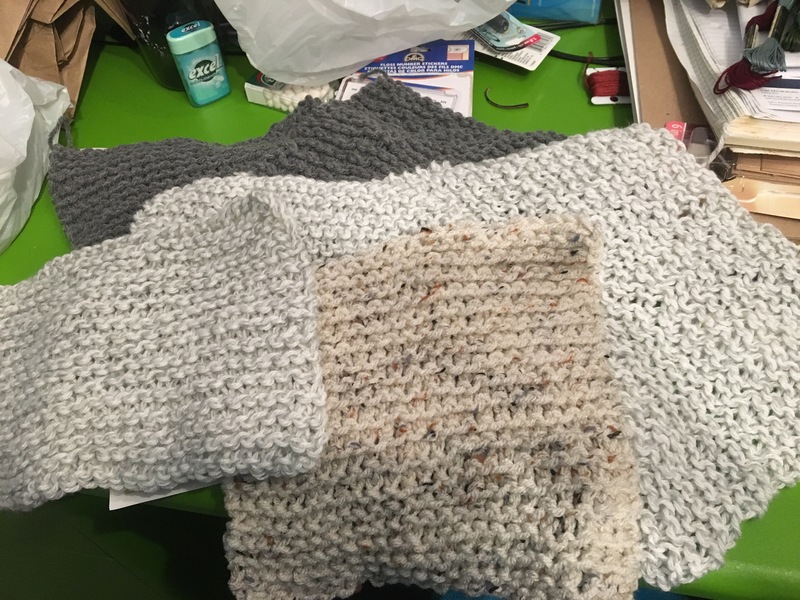 With no internet though I did have a lot of time for some crafting and now I finally have time to go on here and show you my progress on my projects. So now that I’m back and I have settled somewhat into living in a new place I guess I should tell you what I’ve been up to.\Luckily for me, I had the day off work so I was able to sleep in and since my boyfriend wasn’t feeling the greatest he called in and we got to spend my birthday together. Before I get into my projects though I would like to say that on the 14th of March I had my 21st birthday. Luckily for me, I had the day off work so I was able to sleep in and since my boyfriend wasn’t feeling the greatest he called in and we got to spend my birthday together. Now for most of my childhood, I have always wanted goldfish or a turtle actually I still do want a turtle. Anyway, the morning of my birthday, my boyfriend told me he was going out to get me a fish and an ice cream cake since he knows I like that kind of cake. So about an hour later, with me getting enough time to finish the dishes and clean the place up a bit, he came home with two little goldfish, fish tank, a little plant, and a display rock. Now growing up I was a big fan of Dr. Suese books, Cat and the Hat wasn’t my favourite book, however, I decided on naming the two fish Thing 1 and Thing 2. A little weird, but there’s two of them and given the names they are full of mischief. The first few days we had them, they really didn’t swim around a lot actually almost none at all, but now they swim around most of the day and they must get along really well because they are always close by each other, whether that’s swimming or just staying still. I kind of thought it would be neat if one was a female and the other a male and they had little babies, I think it would be really cute. Well, let’s move on to some crafting. 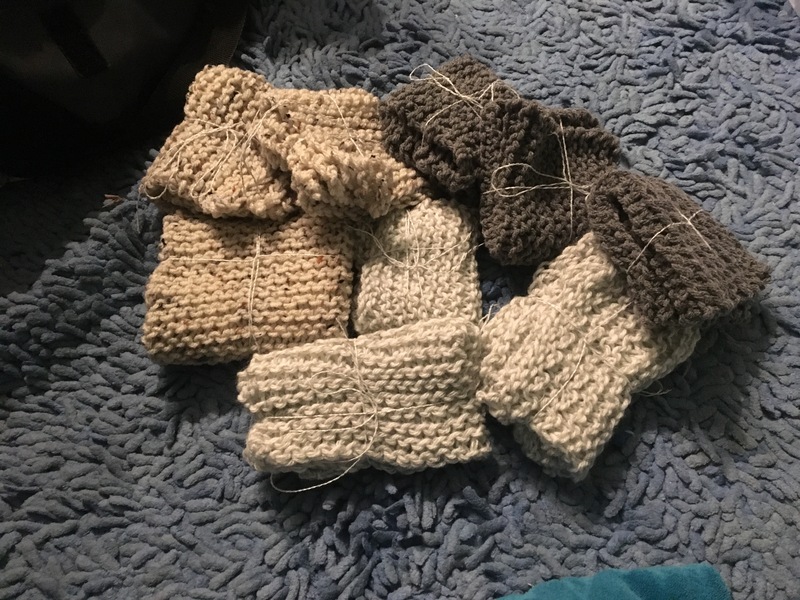 I started a new knitting project since a lot of my crafting things were still packed away. It’s not a really big project, I’m just making a small shawl to go around my shoulders since they get cold all the time and sometimes I really don’t feel like wearing a sweater. 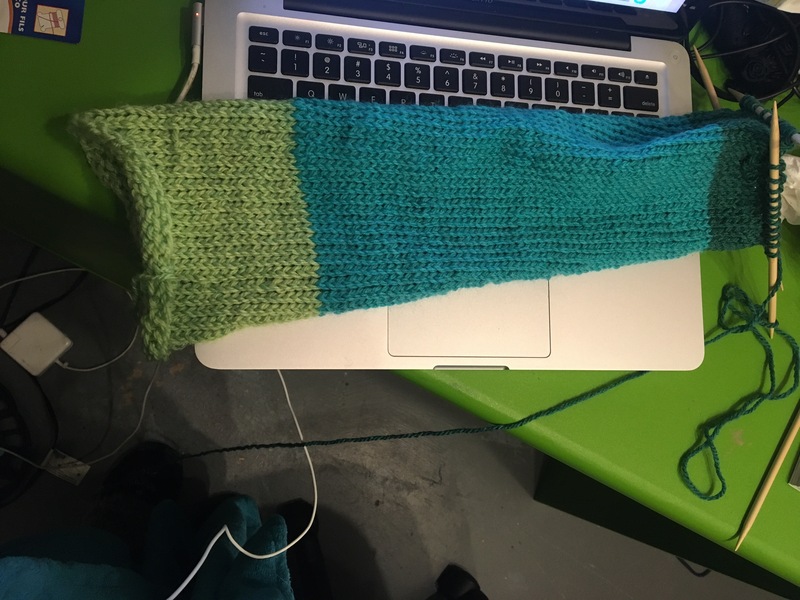 Here is what it looks like so far: As you can see, I’m not using any special pattern, just a basic knit purl pattern that I found on Pinterest. 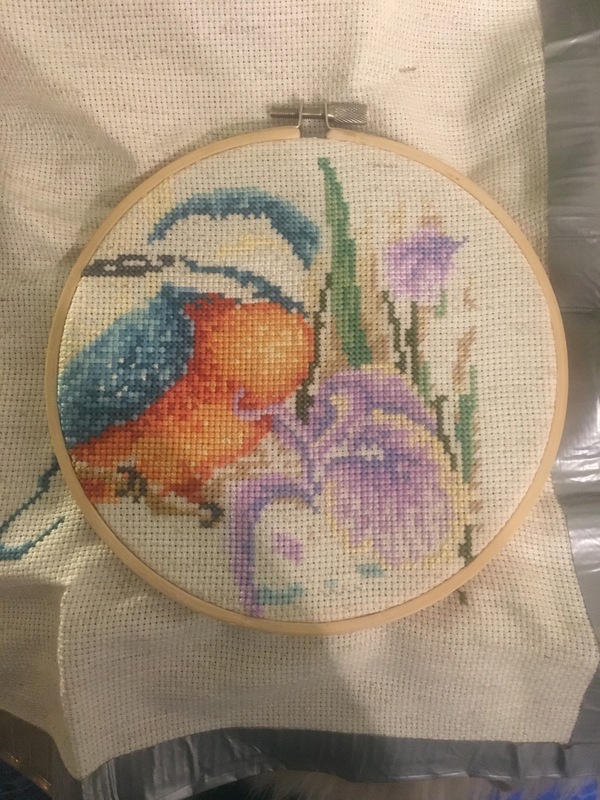 I haven’t worked that much on other projects mainly thing one, but I want to be doing an update of my cross stitch projects sometime this week or early next week. Wow, it’s been a long time. Sorry everyone, I meant to update something either cross stitching or the socks a lot sooner. Anyway, last week was very busy. For almost the whole week I wasn’t feeling that great, but of course, as I have been told many times I was being stubborn and went to work anyways. And well since I usually get bad luck for trying to push myself through the week I was very sick for the whole weekend and had to call in sick on Monday…sadly. 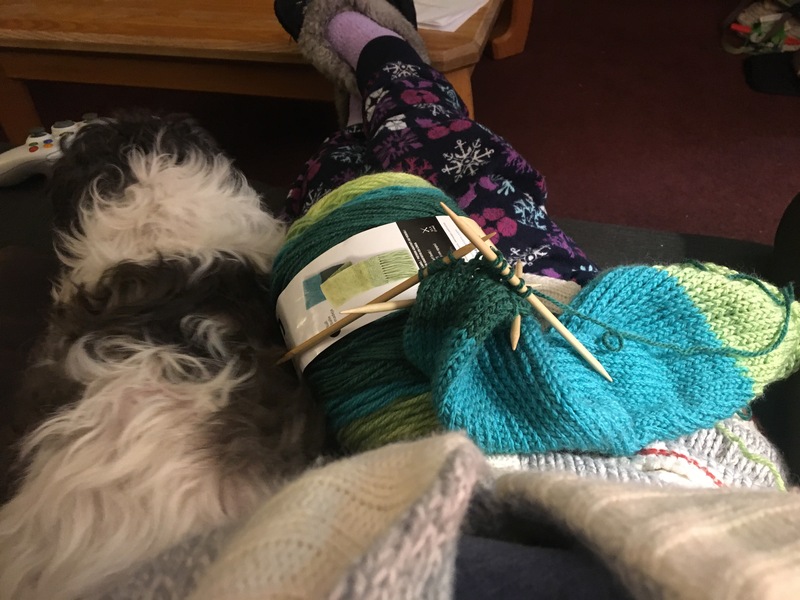 So with me not feeling that great I was pretty much going to work, coming home and getting into comfy clothes, and then knitting away. That’s quite a lot more done than what I had shown you guys in my last post. I guess I probably should have updated a lot more last week, but truthfully I didn’t really feel like writing and I just thought I would make one big post later with all the progress I made. To be fair when I thought of making a big post with all the updated pictures I really didn’t think I would have done as much as I did, but now looking at all the pictures I guess I was wrong. 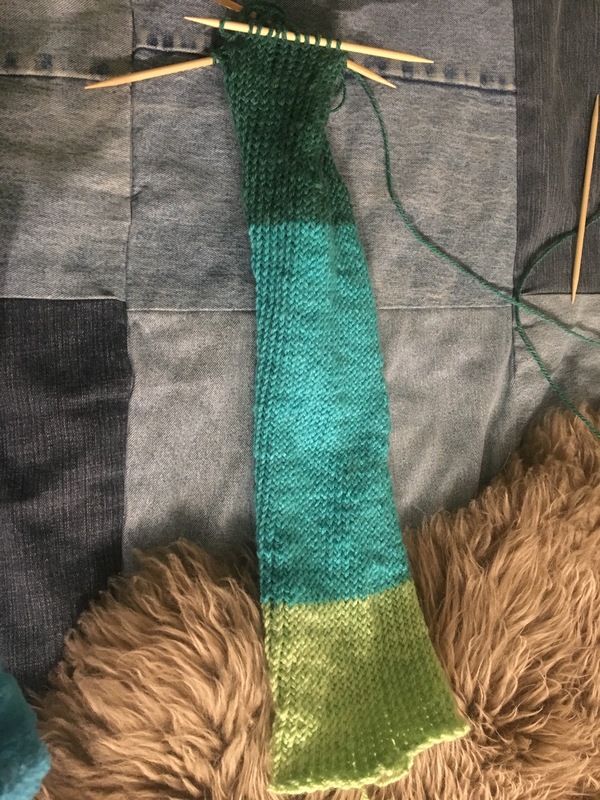 I will admit that when I was getting close to the end of the sock that it was feeling like it was taking forever to get finished, it was like ever time I finished one whole round or two it looked like it didn’t go anywhere, but I’m guessing I just wanted to be finished the first sock. So finally on Monday, since I was still not feeling well and called in sick to work I pretty much spent the whole day in bed, listening to music, watching Netflix, and knitting away. Well there you go I finished one whole sock. 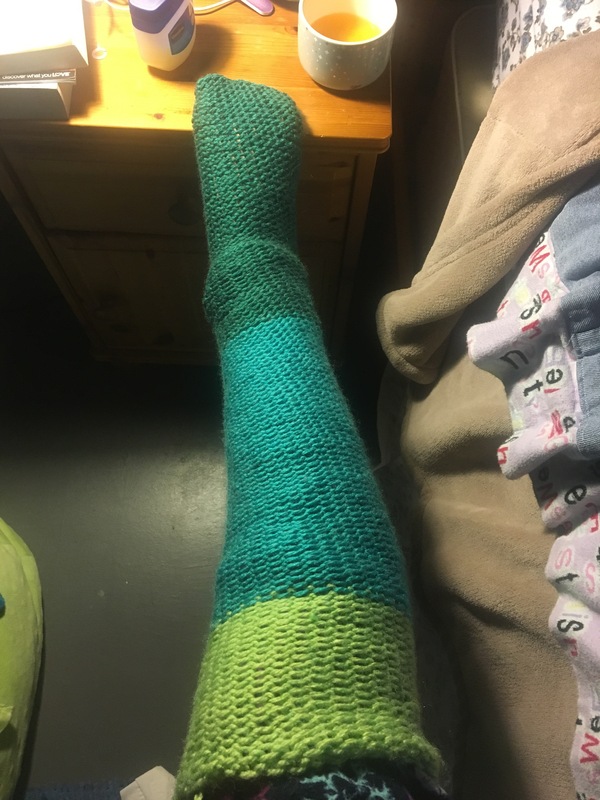 It doesn’t look as nice as I wanted it to look and I don’t think I did the heel the way you are supposed to, but then I just have to keep telling myself that this is my first time using double pointed needles and making socks. With that in mind, I think I did okay. 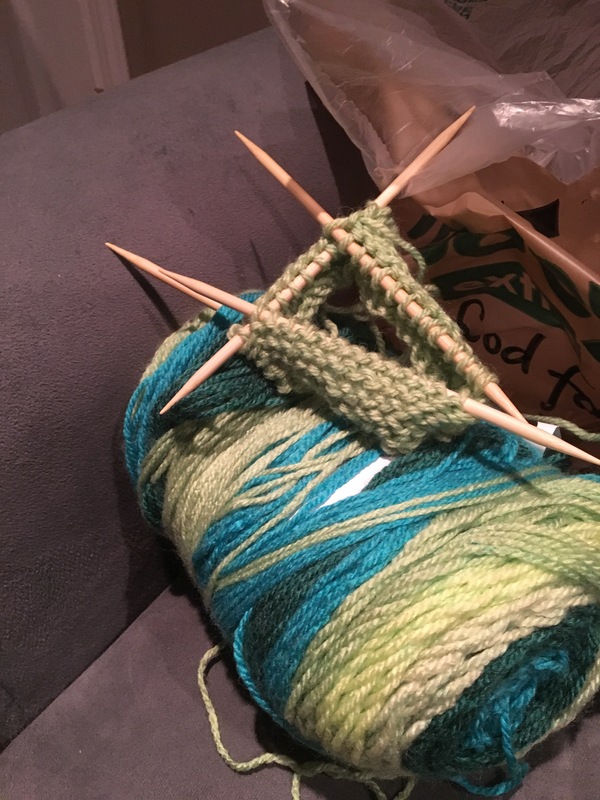 So for a very long time I have always wanted to try knitting something with double pointed needles but have actually never done it. Until now! For Christmas, my boyfriend’s mom(not really sure if I should call her mother-in-law or not) got me some very beautiful variegated yarn. The brand name is Caron Cakes and it is such nice soft yarn, perfect for making clothes out of. So me being me getting something new like that I admedatly started thinking what I could make with it, even though I’m working on two cross stitch projects and have a blanket I haven’t worked on in over a year(When I start working on it again I’ll make a post). So I eventually thought that I would try my hand at finally using double pointed needles and making something using this new yarn. Of course I told my boyfriend about my great idea and that I would just have to wait till I went to Micheal’s(since that’s the only place to get craft supples) to get the needles and I should just wait till after I finish one of my cross stitch projects. I know not very much but it took about five tried to get it right, and of course help for the internet and going on knitting for dummy’s website(it was the first to pop up). Now today I got to do a lot of work on it. 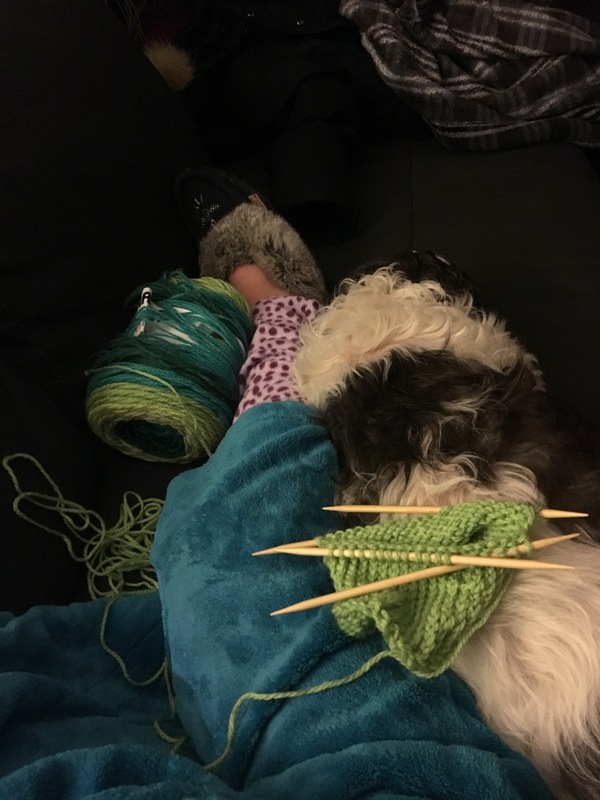 Here’s my work and yarn with my dog curled up next to it(thank goodness he didn’t get on the piece and pull out the stitchs). 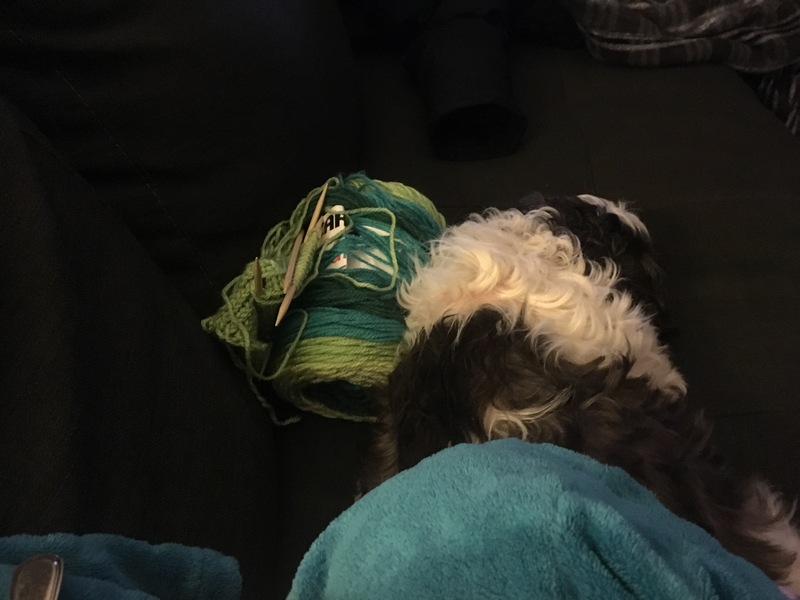 I should see one time if I can get a picture of him how he curls up next to me when I cross stitch. Well that’s all for now. I hope to send you guys another update some time next week. So I hope everyone had a good Christmas or Holiday with your families. I had a great Christmas with my family, in fact I woke up to it snowing! I was so happy! The only two things I wanted for Christmas was my grandma coming home (which happened just a week before Christmas) and for snow! So I was able to get a white Christmas after all, which is usually something I don’t have to wish for since there have been years where we get snow in October or late September. So as you can see I haven’t done that much work on it, but I think it is coming out really nicely. As you can see I have changed it up a bit. On the picture of the pattern I showed you in my last post everything is a light blue and a dark blue, but I have decided to change that up a bit. The flower and the leaves of the flower are going to be different. And as you can see I have made it the colour of a red rose. I’m not really sure if I will change any other colours but who knows I might get really tired of all the blue. 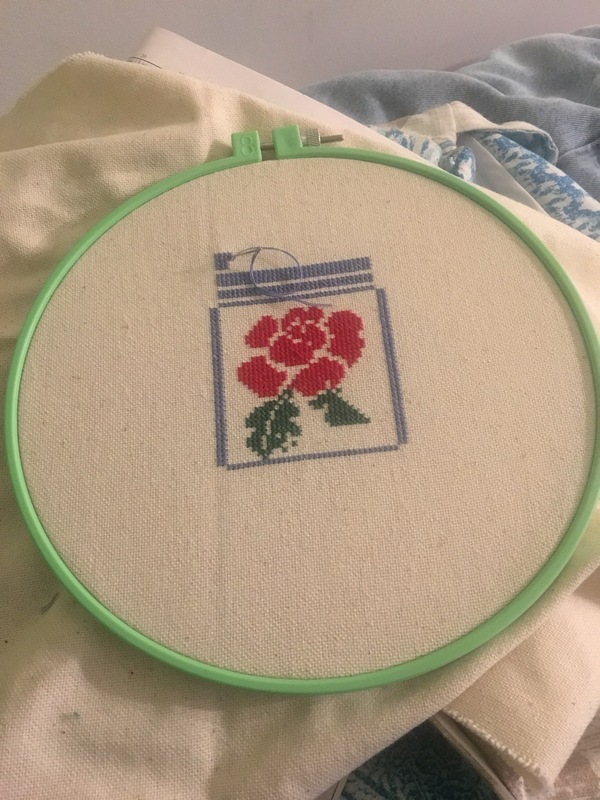 I know that before I mentioned that I was going to give this to someone as a gift and have it done before January 20th, but I have realized that, that just isn’t enough time to finish it. At least for me, I just am not a fast cross stitcher, actually I’m not fast at any of my crafty things. I enjoy just doing it and taking my sweet old-time with it. So I am finally going to give you an update on Nature’s Beauty. I thought it would be a good idea to show you what it looks like before the new year arrives. I think it is coming along really nicely and truthfully I can not wait to see what it looks like when it is all finished and framed. Okay well this will probably be the last post of the year so see you all next year! So as I may have mentioned in previous posts, I am making dish cloths for my mom for Christmas. I haven’t really decided how many I am going to make so we will just have to see, it will more depend on time then anything else. In the picture above is how many dish cloths I had last Friday. Now thanks to a lot of crafting over the weekend with my boyfriend I have finish some more. I’m not really sure if you can tell, but there is six dish cloths. I’m still feeling like that isn’t enough so I might make three or four more, not so sure yet.